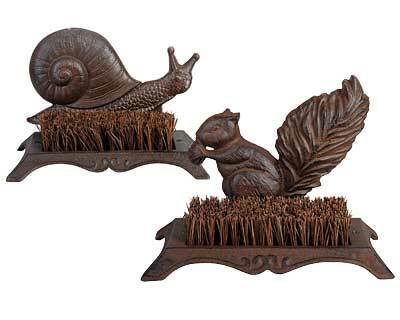 Showcase your love of wildlife at your doorstep with these Esschert Design Cast Iron Snail and Squirrel Boot Brushes. Placing a boot brush near your entryway subtly encourages guests to wipe their shoes prior to entering, and these hardy units offer a fun look as well. The robust, cast iron frames each have flared legs, creating stable bases for the items. A wealth of bristles fills the center of each base, providing a spot for guests to wipe shoes with ease. A detailed snail figure creates the back of the Esschert Design Cast Iron Snail Boot Brush, with an inquisitive expression thanks to its extended neck and lifted antennae. A spiraling shell with vertical lines, along with a textured body, completes this charming unit. Pair this brush with the included Esschert Design Cast Iron Squirrel Boot Brush, featuring a squirrel figure resting on its two back feet and grasping an acorn in its front paws. The lifted, bushy tail and raised ears offer an alert look to the squirrel, enhanced by a wealth of texture. A deep brown tone adds a classic look to each brush, while black accents provide depth and contrast. The units rest on a level surface easily, and the cast iron frame remains durable for many seasons. Bring a touch of wildlife to your patio in a fun way while encouraging guests to wipe their shoes with these Cast Iron Snail and Squirrel Boot Brushes.